I think I’m becoming a Navy sports groupie. Perhaps I need to “get a life.” But in the meantime, a highlight of my last trip to Annapolis was a full-day Navy basketball triple header. We started the day at 9:00 AM, watching the Navy JV basketball team (of which our son is a member) play the NAPS (Naval Academy Preparatory School) team. Then the Army-Navy basketball doubleheader kicked off in Alumni Hall with the varsity women’s game at 1:30 PM and the varsity men’s at 4:00 PM. Our son’s game was in the old Halsey Field House gym where my husband used to play when he was a midshipmen. It was a rather unremarkable game, other than the fact that my son got a Charlie horse on each leg and hurt his foot when someone stepped on it. But just being back in a gym watching my son play basketball was pure gold. After lunch we moved over to glittering Alumni Hall for the Army-Navy games. For the uninitiated, it must be understood that a primary goal of the U.S. 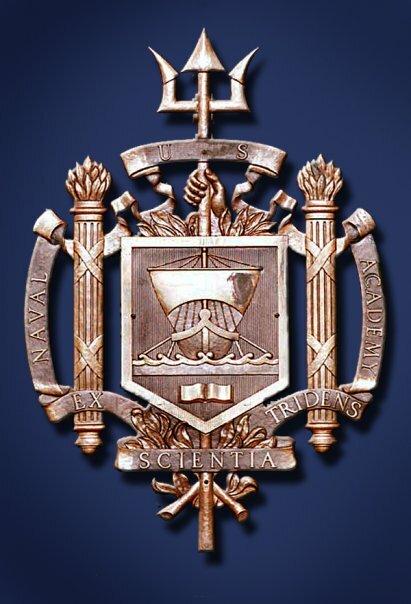 Naval Academy (“Navy”) is to beat the U.S. Military Academy (“Army”) at everything and anything they can. Likewise, a primary goal of Army is to beat Navy at everything and anything they can. At times that seems a larger mutual objective than preparing for any foreign enemy. 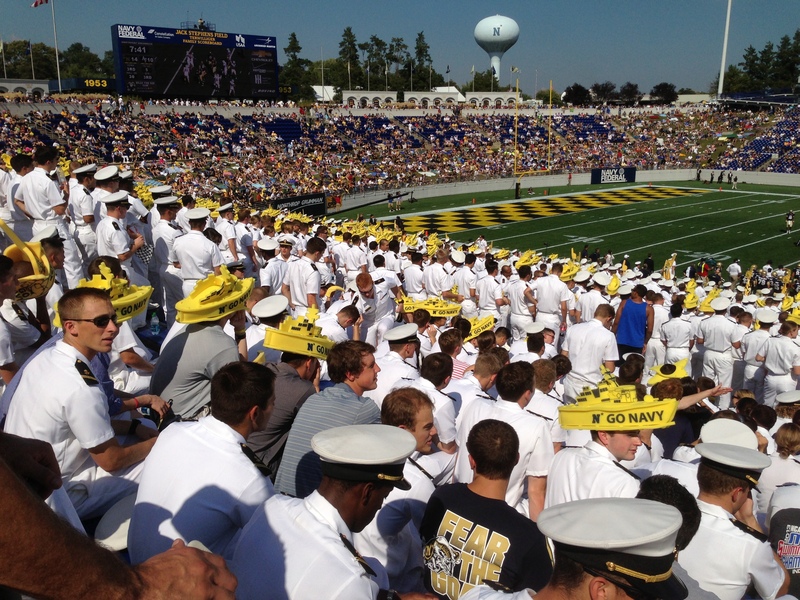 When Navy plays Army in any sport, emotions run at a fever pitch, and a carnival atmosphere results. 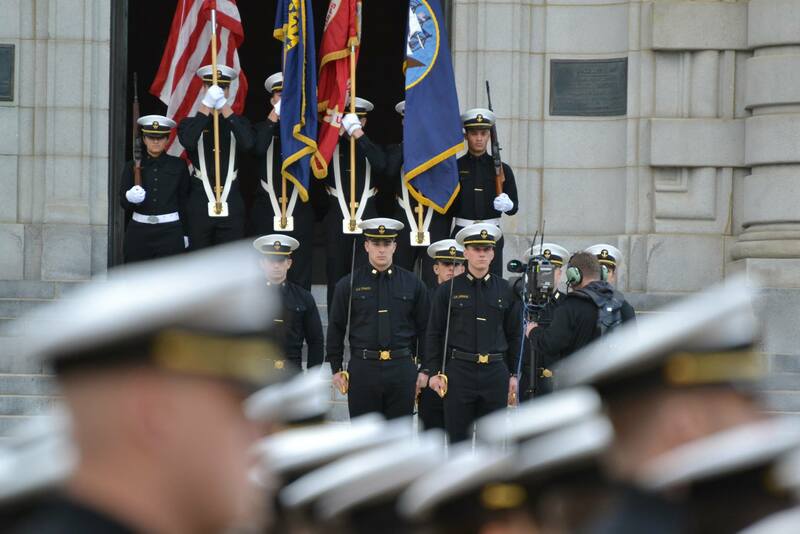 It is impossible not to be swept up in the spirit of the Army cadets and Navy midshipmen. There were so many enjoyable things about the day. First, I love watching the level to which women’s sports have risen. Having parented only boys, I’ve watched only men’s games for years. Title IX has certainly changed the complexion of the sporting world. At my high school, the big sports for girls were swimming and softball and I don’t recall the teams given much priority. Although I’m sure it happened, I don’t remember girls winning athletic college scholarships. It was not particularly cool to be a female “jock” in high school. I felt my heart swell with pride watching the Navy women play basketball. They are strong and skilled yet still feminine. Off the court, they are studying science and engineering at one of the most rigorous technical universities in the country. They give me hope! The halftime entertainment was a group of precision jump-roping elementary and middle school girls called the “Firecrackers.” They were unbelievably proficient in their tumbling and rope-skipping routines, bringing the midshipmen to their feet with applause. 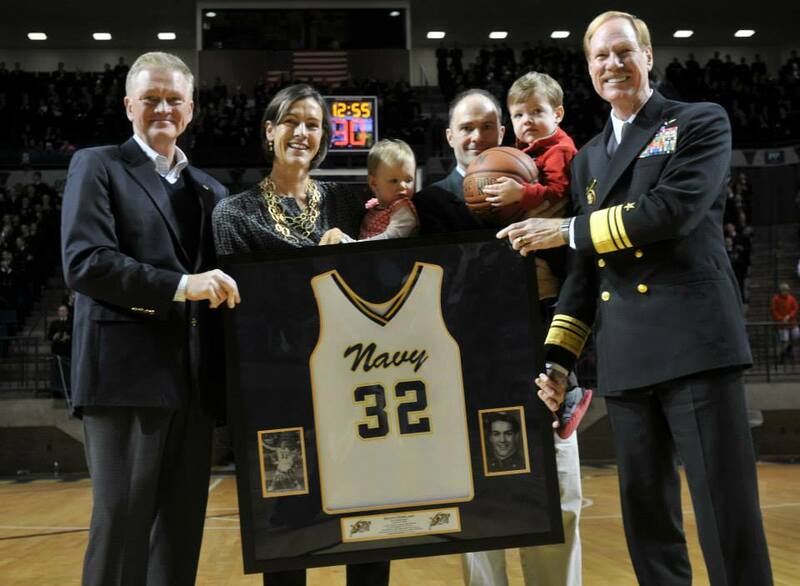 Also at halftime, the Naval Academy Athletic Association retired the first jersey of a woman basketball player, Cdr. Becky Calder (formerly Dowling), a member of the USNA Class of 1998. As I listened to her biography, I was impressed with her accomplishments on the basketball court. She was credited with sparking the first successful era for the Navy women’s basketball program at the Division I level. Her class’s four-year total 80 victories set a school record at the time and helped the Navy women win their first Patriot League regular season title. Individually, Dowling was selected as the Patriot League’s “Rookie of the Year” in addition to a trio of all-league accolades. She still ranks among Navy’s top 10 career leaders in 15 statistical categories, including 1st in rebounds, rebounding average, steals and minutes played, while also standing 6th in points scored. Even more so, I was impressed with her accomplishments after graduation from the Naval Academy. Dowling attended flight school and trained to fly the F/A-18 Super Hornet. She became the first female pilot to graduate from Navy’s Strike Fighter Tactics Instructor program, more commonly called TOPGUN. 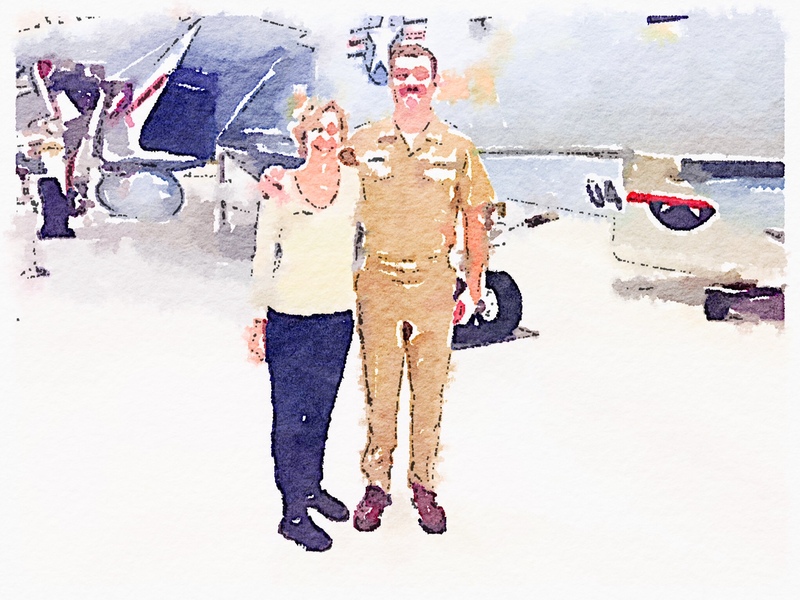 Dowling was an active duty pilot for 14 years, serving aboard aircraft carriers during Operation Enduring Freedom and Operation Iraqi Freedom. When interviewed after the game, Becky said “I’m extremely humbled to be the first player in program history to have my jersey retired. I’m proud, but what makes me most happy is knowing that I won’t be the last.” I loved that the current Navy women’s team stayed court side during the half-time ceremony, and the look of inspiration on their face was priceless. Way to keep chipping away at that glass ceiling! Then it was announced that between basketball games, members of the Navy football team would be in Alumni Hall signing autographs. I was beside myself. I bolted from my seat to search out my favorite Navy players. Mainly I wanted to see Keenan Reynolds (QB) and Nick Sloan (PK). Although I tried not to be TOO obvious, I have what I can only describe as a “Mom-Crush” on these two players; meaning I wish I could be their second mom. It is totally irrational, but through three seasons of attending most Navy football home games, and following the ups and downs of the team and individual players, I found myself bonding from afar with these young men. I feel an odd kinship and pride in them like they were my own sons. Reynolds, because we’ve watched him play out the all-American success story – thrust into a big game as a freshman to relieve an injured (and ineffective) starting quarterback and leading his team to victory and who is on his way to becoming one of the most successful QBs in Navy history. Sloan, the kicker, because he’s from San Diego and I admire how he kept his composure this past season to achieve success following crushing failures. 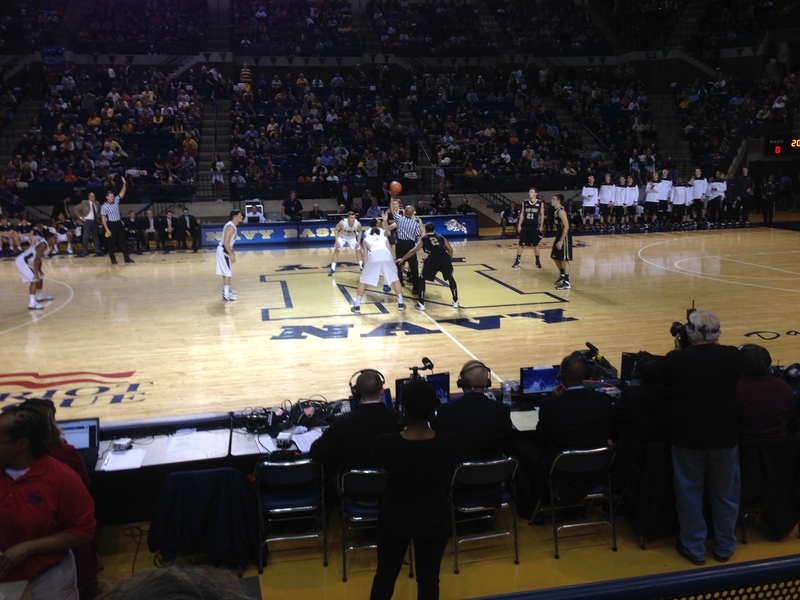 Then I went back to my seat and watched Army beat Navy by five points in the men’s basketball game. 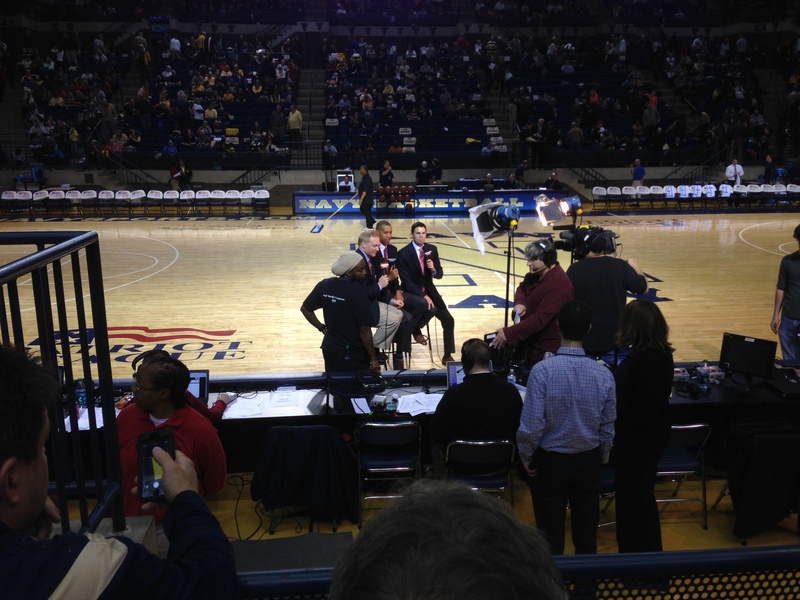 But not before Reggie Miller (former UCLA basketball star) showed up to do the play-by-play and sit less than 20 yards in front of me. The “Firecrackers” put on another spectacular halftime show, again bringing the midshipmen to their feet. At the end of the game, the Army alma mater played last, but it was still a great Navy day. It was the kind of day I have almost come to expect when visiting the Academy, where I am surprised and delighted and inspired by the talent and character of the young people I am exposed to. And I am never washing my right hand again. I had the option of 3 seminars, the other two being (1) Project Based Learning and (2) Athletic Excellence. Both sounded interesting but less thought provoking. The topic of Ethics appeals to me for several reasons. I have always been fascinated by the discussion of ethics, whether in the legal profession or the business world, and by how people apply ethical principles to difficult situations. I was especially interested in how ethics is applied in military situations and what principles and frameworks are being taught to the Midshipmen. In order to obtain my law license, I was required to take a supplemental section of the Bar Exam on Legal Ethics (no, that is not an oxymoron). Ethics can be a rigorous form of mental gymnastics, trying to apply black and white principles to gray situations. And where else are the situations as gray as the life or death decisions in the ambiguous modern world and our War on Terror? Why is there a disconnect between our thoughts about ethics and our actions? Why do we do wrong when we know it is wrong? Why do we do right? At one point, one of the Mids (I wrote her name down because I was so impressed and I expect to see great things from her in the future) made an observation that really blew the entire room away. After much discussion from the audience about how unprincipled young people are today, the Mid calmly and tactfully observed that her generation was raised by parents who would condone or at least tolerate cheating if it meant getting A’s and getting into the Ivy League school. One of the other Mids shared that he and his company and room mates, based on the framework for ethical decisions that are taught at the Academy, often stay up until wee hours of the morning discussing different military and political scenarios and arguing what would be the right approaches and outcomes. The last point the Professor made that I found impactful was a chart that demonstrated the components of effective leadership. I didn’t snap a picture of it with my iPhone (I thought that might be unethical) so I don’t remember the specifics, but it listed the relative importance of the parties (e.g., country, team, etc.) and on the bottom was “self”. The point being that an effective leader puts his or her self-interest last. The Professor observed that this was what was so difficult about Plebe Summer. Recently-graduated high school seniors, who were mostly hot-shots and superstars in their high school careers, show up at the Academy and the “self” gets knocked from first to last place, fairly abruptly and dramatically. There was further discussion from the Mids about how, even though there is tremendous pressure at the Academy to succeed, there is also a leadership environment that encourages team rather than individual success. I left the planetarium wide awake, with that familiar mental gymnastics fatigue associated with ethical discussions, but a deep sense of hope that we have an upcoming generation of leaders who are schooled not only in technical aspects of military operations but the ethical and leadership facets as well. It also made me wonder whether some of our country’s leadership problems stem from having fewer elected officials with military backgrounds, given that only 2% of the population is now serving in the military. How about compulsory military service for politicians?